Joseph BATCHELLER (1604 -1647) may not have been Alex’s 10th Great Grandfather; one of 2,048 in this generation of the Miller line. Honorable Joseph Batcheller was born about 1604 in Canterbury, England. His parents were Mark BATCHELDER and Mary FANTINGE. Joseph married Elizabeth DICKENSON in 1628 in England. 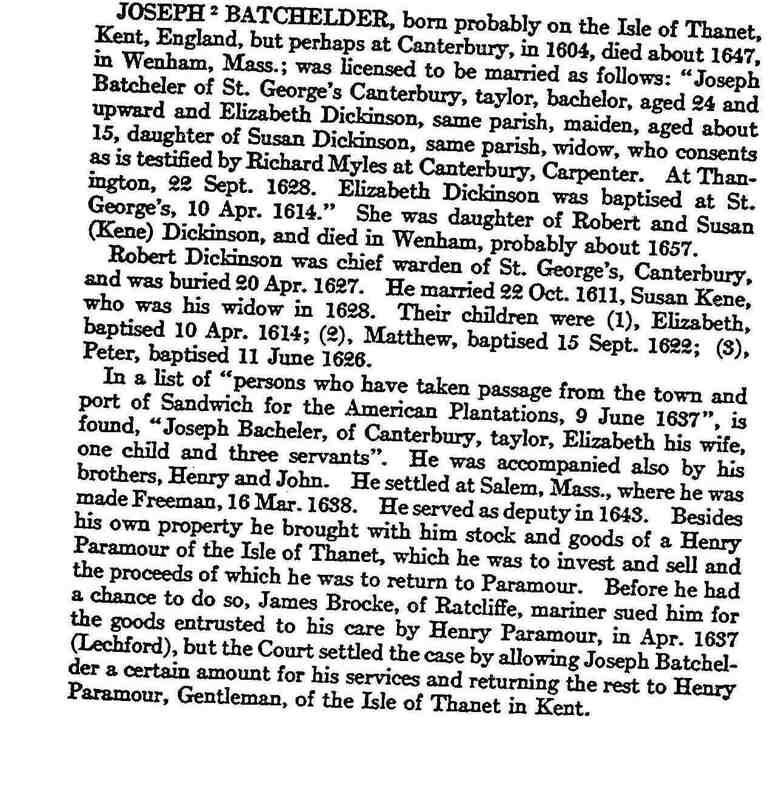 He was of the parish of St. George, Canterbury, on 22 Dec 1628, when a licence was granted for his marriage with Elizabeth Dickinson, of the same parish, virgin, aged about 15, daughter of Susan Dickinson, of the same parish, widow, In this licence he is called Joseph Batcheler. The marriage was to be solemnized at Thanington. Today Thanington Without is a civil parish and Community in Canterbury Kent United Kingdom. Many people, including locals, will say that Thannington is outside Canterbury’s medieval city walls, giving the place its name, but the truth is more complex. If this version were true, other Canterbury districts (such as Wincheap, Nackington, St Stevens and St Martins) which are outside the walls would also have to be called “Without”, but they are not. In fact, Thannington is outside the area occupied by most of the Canterbury parishes – it stands alone and isolated, hence outside the area of “greater” Canterbury and nothing to do with the city walls. Joseph immigrated to America in 1637 on the ship “Hercules“. with his wife, son Mark, three servants and brothers Henry, John and Daniel. He was listed as a tailor on the roll of persons who made the passage from Sandwich for the American plantations. Joseph died in March, 1647. The church records said “In ye mesne space it pleased God to take to himself brother Batchel., a man wise, moderate, and very able to be helpful in such cases.” (the case was one of church discipline at the time). His son Mark was the administrator of the estate. Elizabeth Dickenson was baptized 20 Apr 1614 in St George’s Canterbury, England. Her parents were Robert DICKENSON and Susan KENE. Elizabeth died in Wenham, Mass about 1657. 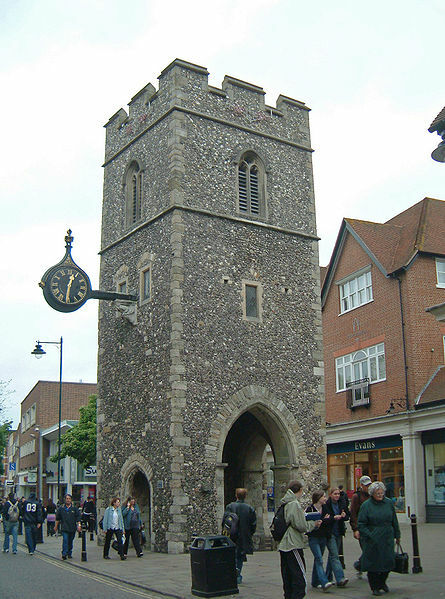 Elizabeth Dickenson was baptized at St. George's Church, Canterbury, as was Christopher Marlowe. The Tower is all that survived of the church after the Baedecker Blitz in World War II. It appears there were two first cousins, both named Ruth, born a couple years apart who both immigrated from Massachusetts to New Brunswick; William FISKE and Marah [__?__]‘s daughter Ruth and Joseph FISKE and Susannah WARNER’s daughter, Ruth. [Susannah Warner was Joseph Batcheller’s granddaughter.] Many genealogies mix these two women up, but it’s not possible that the same woman was mother to both Richard ESTEY‘s children and David Kilborne’s children because they were born at the same time. It”s more likely that William Fiske’s daughter was our ancestor, but I’m including posts for both families. 20 April 1665 in Ipswich. March 10, 1687/88 in Ipswich, Massachsetts. This notable and long-established surname is of Old French origin, and is a status name for a young knight or novice at arms, deriving from the Old French “bacheler”, from the medieval Latin “baccalarius”. The name was introduced into England by the Normans after the Conquest of 1066, and was adopted into Middle English. By the 14th Century the word “bachelor” had already been extended to mean “(young) unmarried man”, but it is unlikely that many bearers of the surname derive it from the word in that sense. Early examples of the surname include: Stephen le Bachilier (Suffolk, 1203); Walter le Bachelor (Surrey, 1248); and Magg’ (Margaret) Bacheler, noted in the 1273 Hundred Rolls of Huntingdonshire. In Scotland, the name has acquired an added meaning, that of “young tenant farmer” or “holder of a small farm”. Joseph resided in Salem and Wenham, Massachusetts. He was made freeman in 1637. He was a deputy from March 16, 1637/38 to 1643. He was the first representative from Wenham to the General Court in Boston in 1644. Original member of church of Wenham 8 Oct 1644. Joseph’s servant, Edward M. Harnett, Jr. apparently did well for himself in Salem. In 1638, with a year of indentured servitude left, he sent for his parents (Edward, Sr. and Sicily) from England. In 1639, Edward, Jr. was released from his servitude to Joseph Batchelor and received a land grant in Salem. Both Edwards were admitted to the First Church of Salem in 1643. Although the Harnetts were Quakers, there was no representation for them in Salem. We find, through the early records of Salem, that the Harnetts became disillusioned with the Puritannical First Church of Salem and that they were clearly Quakers as they were fined for “absence from meeting”. Salem records give us an indication of when Edward, Sr. may have died. At a meeting held in Salem on August 31, 1658, Edward Harnett, tailor, “beeinge now about to remove out of the towne, apprenticed Jeremiah, son of Alice Chichester, until he has reached the age of twenty-one, being now about 3 months, for which the towns of Salem and Marblehead agree to pay the said Harnet 8 pounds sterling, and the said Harnet agrees to free the towne from any further charge regarding the said Jeremiah Chichester.” Perhaps the combination of his father’s death and continued oppression by the First Church of Salem, Edward Jr., along with his wife, children and widowed mother, moved to Huntington, Long Island, New York. Mark lived in Wenham; was constable, 1663 and 1666, trial juror, 1658, 1663,1664; and was killed.as a soldier in the company of Capt. Joseph Gardner of Salem, Dec. 19, 1675, in the Great Swamp Fight. His estate was valued at £131. John’s second wife Sarah Goodale was born 31 MAY 1640 in Salem Village, Mass. Her parents were Robert GOODALE and Catherine KILHAM.. Sarah died 22 MAR 1729/30 in Wenham, Mass. John was one of the Jury during the witchcraft cases in Salem. He signed a Declaration of Regret asking forgiveness for the error of their judgement. “We whose names are under-written, being in the year 1692 called to serve as jurors in court at Salem, on trial of many who were by some suspected guilty of doing acts of witchcraft upon the bodies of sundry persons, we confess that we ourselves were not capable to understand, nor able to withstand, the mysterious delusions of the powers of darkness and Prince of the air, but were, for want of knowledge in ourselves and better information from others, prevailed with to take with such evidence against the accused, as, on further consideration and better information, we justly fear was insufficient for the touching the lives of any (Deut. xvii) whereby we fear we have been instrumental, with others, though ignorantly and unwittingly, to bring upon ourselves and this people of the Lord the guilt of innocent blood; which sin the Lord saith in Scripture he would not pardon (2 Kings xxiv. 4)–that is, we suppose, in regard to his temporal judgments. We do therefore hereby signify to all in general, and to the surviving sufferers in special, our deep sense of, and sorrow for, our errors in acting on such evidence to the condemning of any person; and do hereby declare, that we justly fear that we were sadly deluded and mistaken–for which we are much disquieted and distressed in our minds, and do therefore humbly beg forgiveness, first of God, for Christ’s sake, for this our error, and pray that God would impute the guilt of it to ourselves nor others, and we also pray that we may be considered candidly and aright by the living sufferers, as being then under a strong and general delusion, utterly unacquainted with, and not experienced in, matters of that nature. This entry was posted in 12th Generation, Historical Church, Immigrant - England, Line - Miller, Pioneer, Public Office, Twins, Violent Death, Witch Trials and tagged The Hercules 1637, Wenham Founder. Bookmark the permalink. What does this even mean. Mesne means middle, God to take means he died, able to be helpful? Did he not do something the church wanted? Then was physically punished and died in the process? Perhaps the church wanted his land? Can someone explain this? Is there any original document proving any of this?